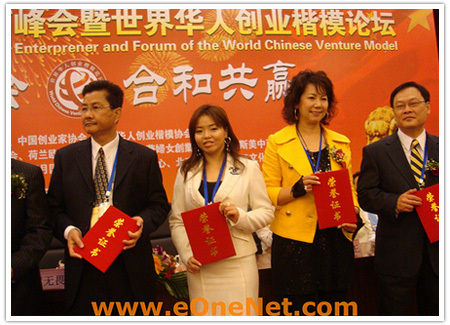 Fione Tan, popularly known as the Queen of Internet Marketing, received the Chinese Women Entrepreneur Award in the Fourth Summit Conference of Chinese Entrepreneur and Forum of the World held in Beijing recently jointly organized by World Chinese Venture Model Association, China Association for Promoting International Economic & Technical Cooperation and China Entrepreneurs Association. This event, held in Beijing Convention Centre, was attended by entrepreneurs from more than 30 countries, including Hong Kong, Singapore, Malaysia, Japan, Thailand, USA, the UK, Australia, Germany, and Finland etc, and recognized top Chinese entrepreneurs from all around the world. This event was covered and was captured in the news in CCTV China on the same evening. Being the youngest Chinese entrepreneur to receive this Award, “I want to thank my customers who demonstrate me that I have much to strive for in my profession. I am always glad to help entrepreneurs and business owners, improve their Internet income. I like to share the joy in them when they see their brand ranked No.1 in popular search engines like Baidu, Google and Yahoo, or when they tell me how many new orders they have received after doing Internet Marketing,” shared Fione passionately in her acceptance speech. This award is in addition to other awards received by Tan, notably the Top 10 Malaysia Women Entrepreneurs Award 2008, presented by the Queen of Malaysia. For more information on her personal particulars, awards and experience, log on to Tan’s website at www.FioneTan.com and for more information of her internet marketing coaching programs and services, log on to www.InternetMarketingCoaching.com. 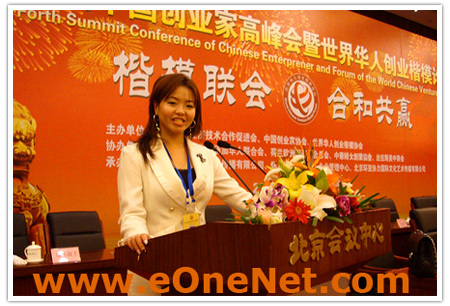 Fione Tan, is the co-founder, President and CEO of eOneNet.com, with offices in Malaysia, Hong Kong and Singapore. She is ranked top Internet marketing coach in top search engines, and has trained more than 30,000 entrepreneurs globally to make money online and expand their business to overseas via the Internet. She has received awards including the prestigious Top 10 Women Entrepreneurs in Malaysia 2008, Chinese Women Entrepreneur Award China. She also sells online with annual sales growing at a compound rate of 100% for 5 consecutive years. 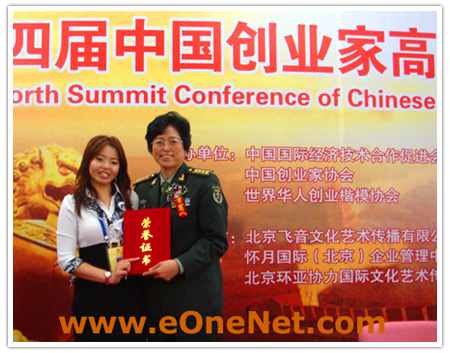 eOneNet.com was set up by Fione Tan and Harrace Lau in Malaysia in 2000. Starting off by selling website builder software, the company has grown to a multinational company with offices in Malaysia, Hong Kong, and Singapore selling different products and services, including its popular Internet marketing coaching since 2003.
eOneNet.com, ranked top Internet marketing coach in top search engines, and has trained more than 30,000 entrepreneurs from different countries to start a business online and to turn a non-profit making website to a website that can sell and receive customers globally.